It feels good to be running the final rendering of the video, and also to be wrapping up the final project of Course Five of COETAIL. Without a doubt, it’s been a challenging project. I began wanting to look at the issue of Tech Literacy across the whole middle school, but Kim wisely steered me towards a more specific project: our Grade 8 Digital Citizenship course in Humanities. I had taught some lessons related to this in the past, I was familiar with the course material; how hard could it be? I quickly realized the difference between knowing and preparing material to teach yourself, and helping coach a team of three teachers with their own unique strengths and styles. At some points, I felt like I almost needed to develop three different units for each of the teachers so that they could all play to their strengths. We met, either one-on-one or in groups of three or four, as often as we could. I also used emails, Google Docs, comments, Google+. I tweeted out questions and asked for advice on COETAIL’s Google+ Community, and did a Hangout with a fellow COETAILer to discuss our projects. I had some ideas for a final summative task, but the teachers were looking at some of the Digital Citizenship curriculum at Yokohama International School and decided that they wanted to borrow their idea: the G08 students would focus on a specific topic and then develop a lesson to teach that topic to G06 students. As the unit wound down, I did an interview with Adam and Lauren so that I could both get feedback from them and also bring some of their words into my final video project. I tried to find time to do an interview with Sandra as well, but we ran into scheduling issues and then suddenly we were out of time. For the final video, I used iMovie more or less for the first time. I have done some little projects with it before, but nothing as complex as this. I found it very helpful to put my titles and photos into a Google Slide presentation and then download each slide as a JPEG to be imported into iMovie. That saved me the trouble of resizing and adjusting everything within iMovie itself. I love the teacher interviews – it would be great to actually see the teachers talking – or at least a picture of them in the classroom teaching, though, rather than just hearing their voice. I love the controversy in the lunch room about students searching for info about their teachers – where did that go? What was the end result of that conversation? Did it spark any thinking on the teachers part about making choices about what they share? Love the way you’ve used social media for students to learn about social media – for example, the poll in G+ is such a simple and effective way to transform that task and keep conversations going in both face to face and online spaces. Thanks for sharing the This American Life podcast – what a great conversation starter for students (and teachers)! Love the 5 minute lesson plan template idea – a great way to ensure consistency among all teams, putting structure into this kind of experience for this project is so important. The one thing missing from this project is examples of student work and images and video of students in action. What did this look like in the classroom? How did the lessons go? What did students think of the whole experience? What did the grade 6’s learn from the well structured lessons? 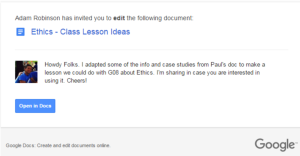 Hi Paul, Thanks for the tip about putting your titles and photos into Google Slides first and then downloading them as JPEGS to use with iMovie. I became a bit frustrated with iMovie when I was making my own Course Five Final Project video, so I am very keen to try out this strategy next time! I enjoyed your video; well done! – Nicola.